This low-profile, high-capacity freshwater reel has a solid magnesium frame and handle-side side-plate, so you can palm it comfortably all day, firing long-range casts until the cows come home. Its perforated aluminum U-Spool holds more line than virtually any other compact reel and is engineered with Daiwa Free-Floating technology to send even featherweight lures out where they need to go. Cut-proof titanium nitrided line guide; 6 stainless steel ball bearings plus Infinite Anti-Reverse roller bearing; Autocast clutch; Magforce-Z magnetic anti-backlash control; 7-disc drag system with fiber composite washers; 6+1 bearings. Gear ratio: 6.3:1. Weight: 7.4 oz. Line capacity: 12 lb./140 yards. "i've had this reel for a couple of years now. i've used it for just about every situation and technique that i know how to. the magforce z braking system is nice. the situation it works best in in my experiences is pitchin and flippin." "I bought two of these reels. The reels are meticulously made. The fit and finish is exceptional. The reel is very smooth on casting and retrieve. The brake is very effective." 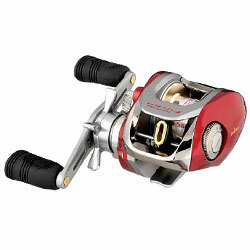 "Bought a pair of these this spring and have since become my favorite reels. Very light, very precise, and very smooth." "i bought this reel last summer and have taken really good care of it but now when i cast it makes a loud noise and i have lots of backlashes since it started making this noise. but when it worked it was a great reel, but i have since then started purchasing shimano reels, dont have to have near as much cleaning."